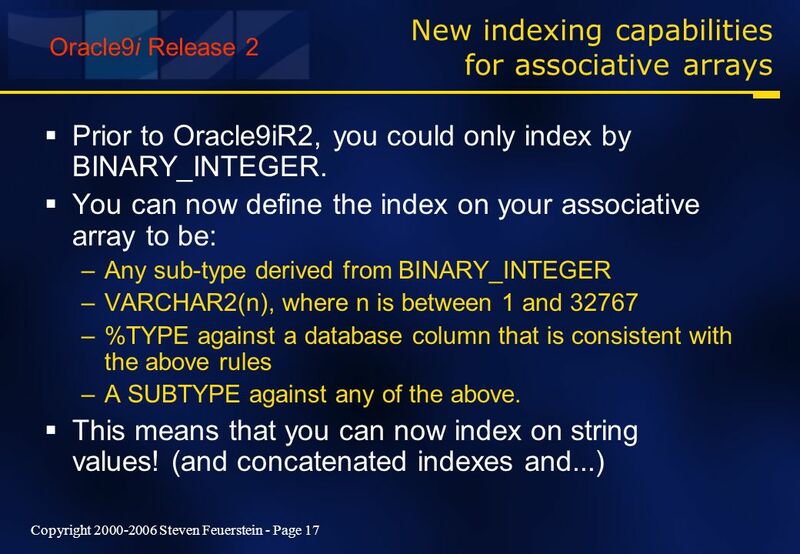 Copyright 2000-2006 Steven Feuerstein - Page 1 OPP 2007 February 28 – March 1, 2007 San Mateo Marriott San Mateo, California An ODTUG SP* Oracle PL/SQL. 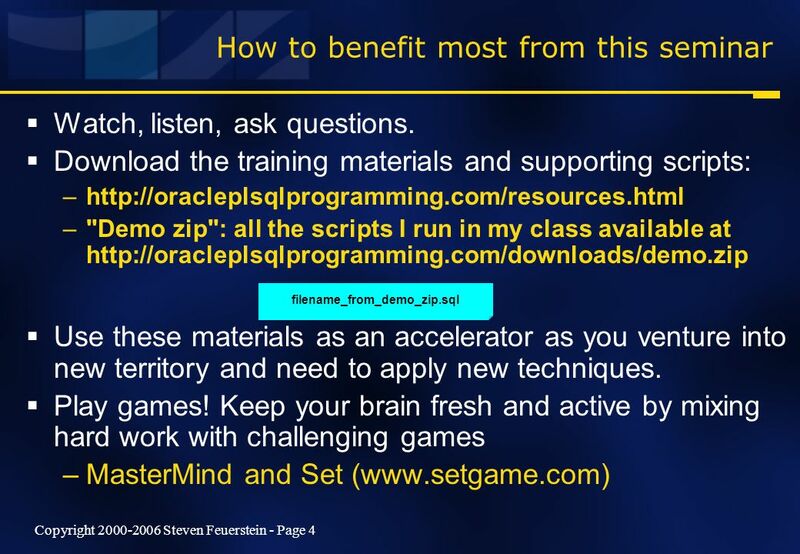 1 Copyright 2000-2006 Steven Feuerstein - Page 1 OPP 2007 February 28 – March 1, 2007 San Mateo Marriott San Mateo, California An ODTUG SP* Oracle PL/SQL Programming Conference * SP – Seriously Practical Conference For more information visit www.odtug.com or call 910-452-7444 ODTUG Kaleidoscope June 18 – 21, 2007 Pre-conference Hands-on Training - June 16 – 17 Hilton Daytona Beach Oceanfront Resort Daytona, Florida WOW-Wide Open World, Wide Open Web! 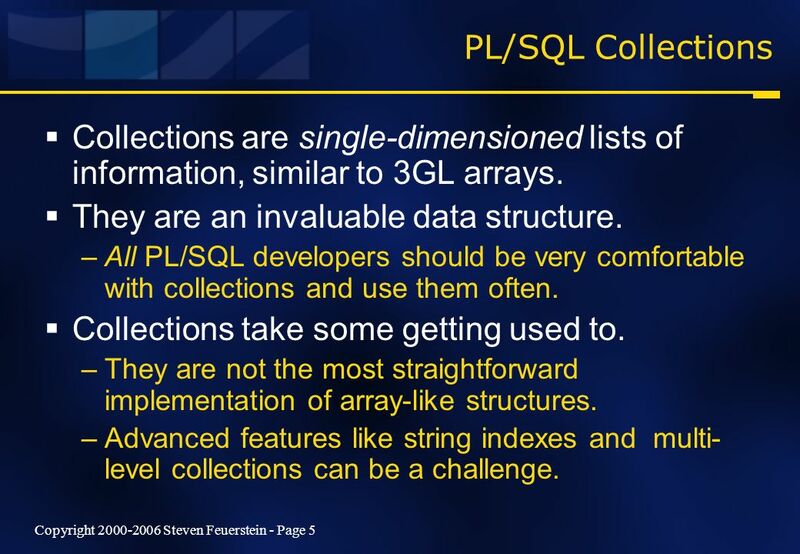 5 Copyright 2000-2006 Steven Feuerstein - Page 5 PL/SQL Collections Collections are single-dimensioned lists of information, similar to 3GL arrays. 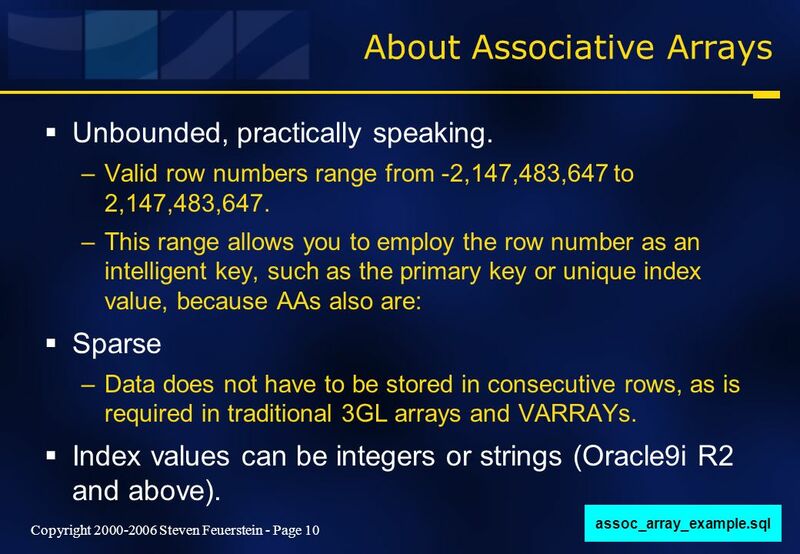 They are an invaluable data structure. 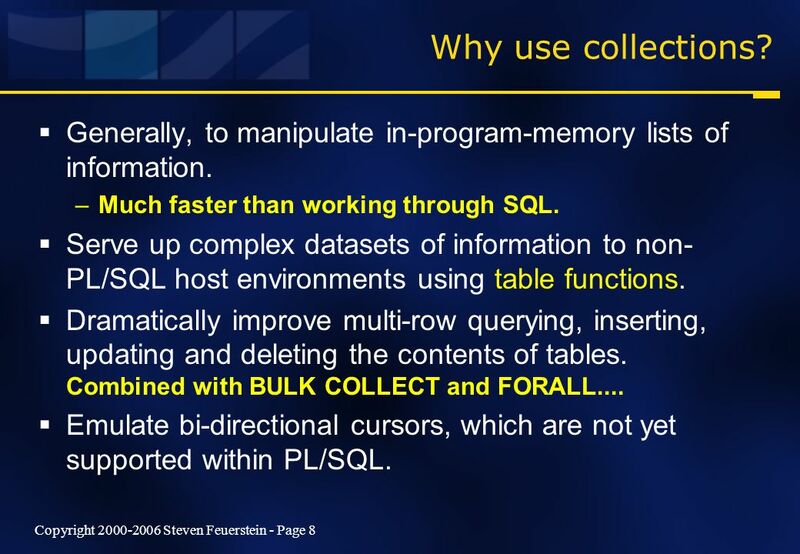 –All PL/SQL developers should be very comfortable with collections and use them often. Collections take some getting used to. 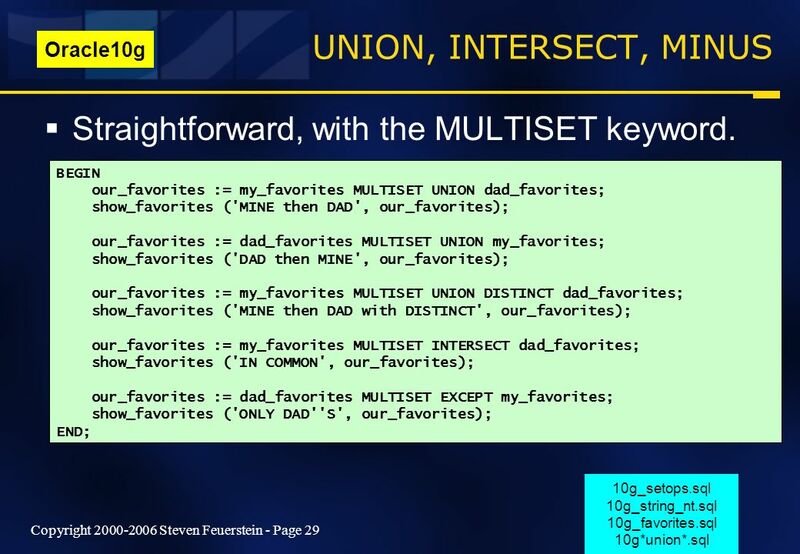 –They are not the most straightforward implementation of array-like structures. 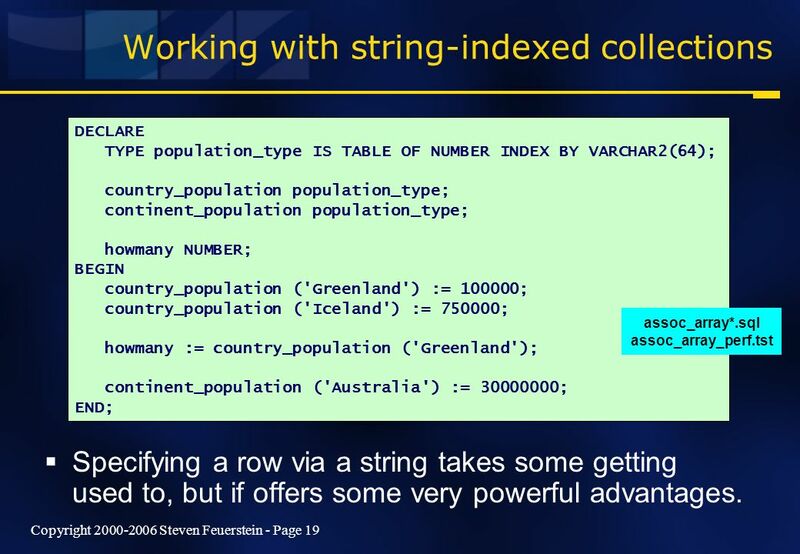 –Advanced features like string indexes and multi- level collections can be a challenge. 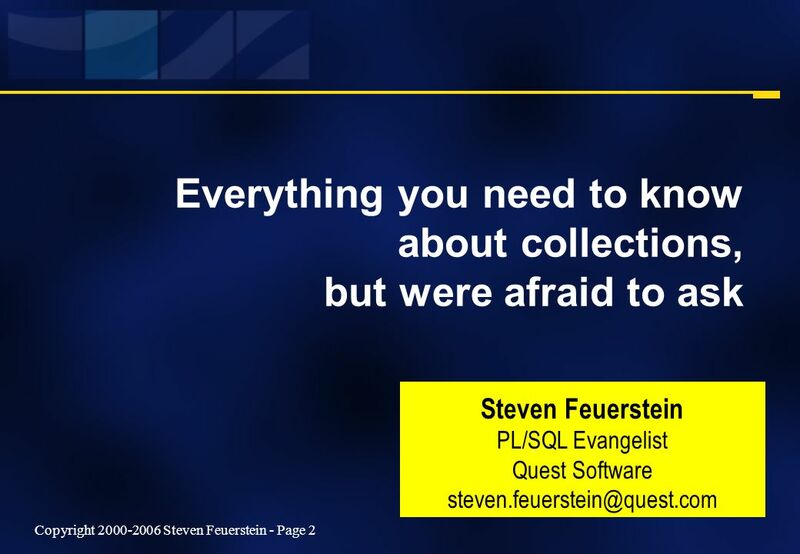 8 Copyright 2000-2006 Steven Feuerstein - Page 8 Why use collections? 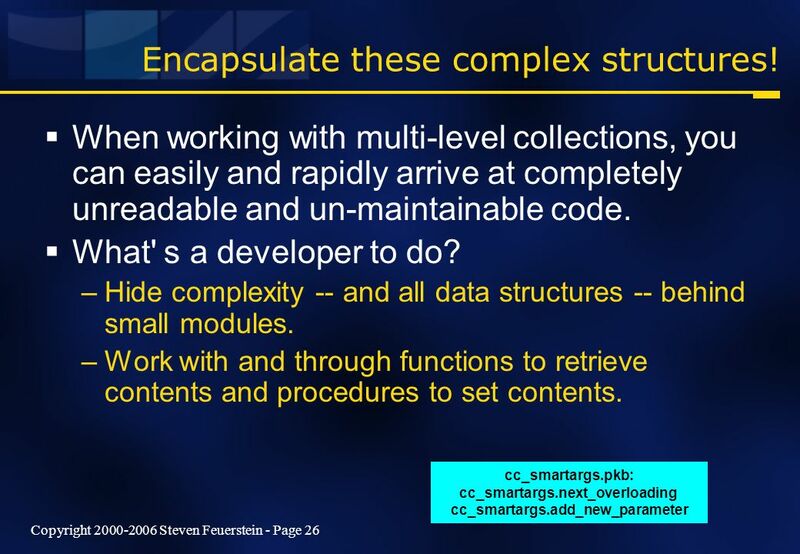 Generally, to manipulate in-program-memory lists of information. –Much faster than working through SQL. 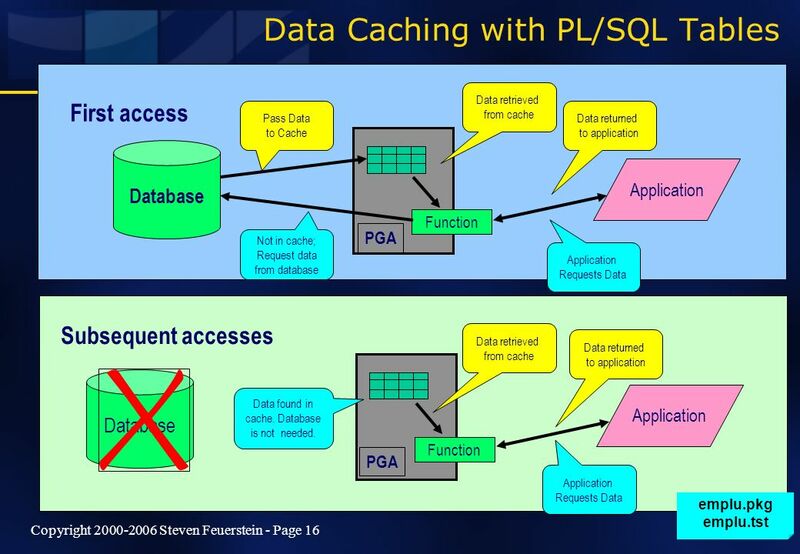 Serve up complex datasets of information to non- PL/SQL host environments using table functions. 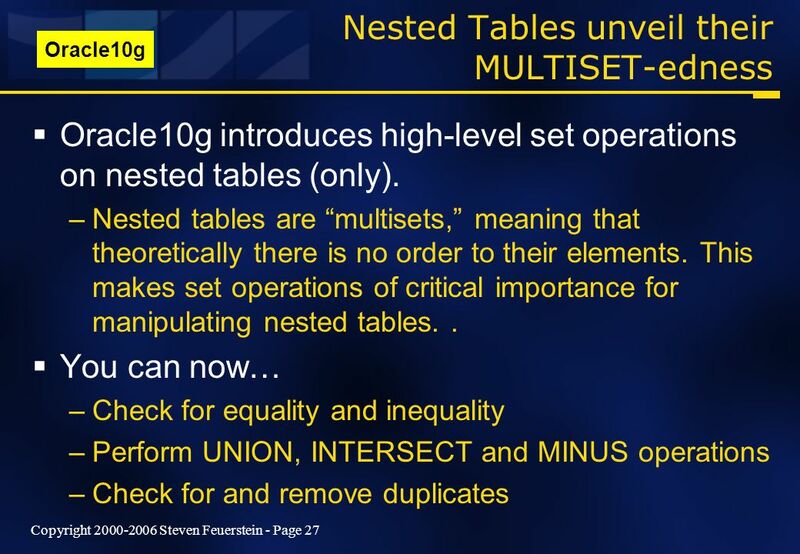 Dramatically improve multi-row querying, inserting, updating and deleting the contents of tables. 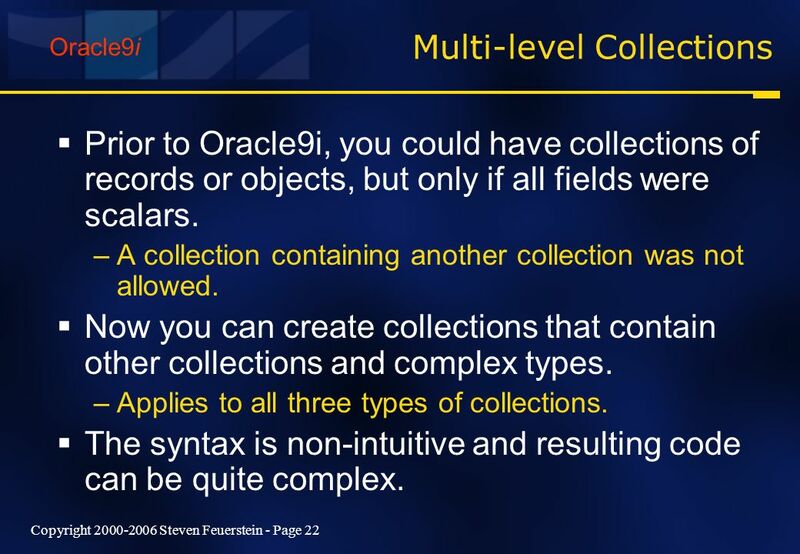 Combined with BULK COLLECT and FORALL.... 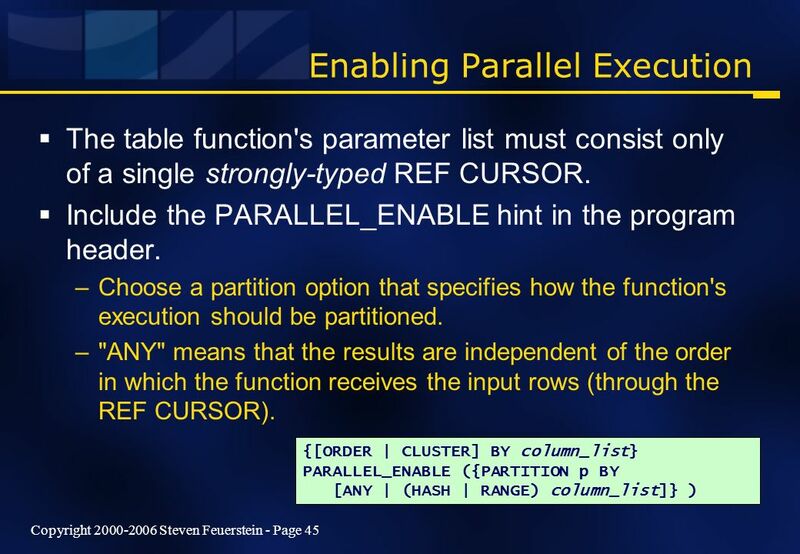 Emulate bi-directional cursors, which are not yet supported within PL/SQL. 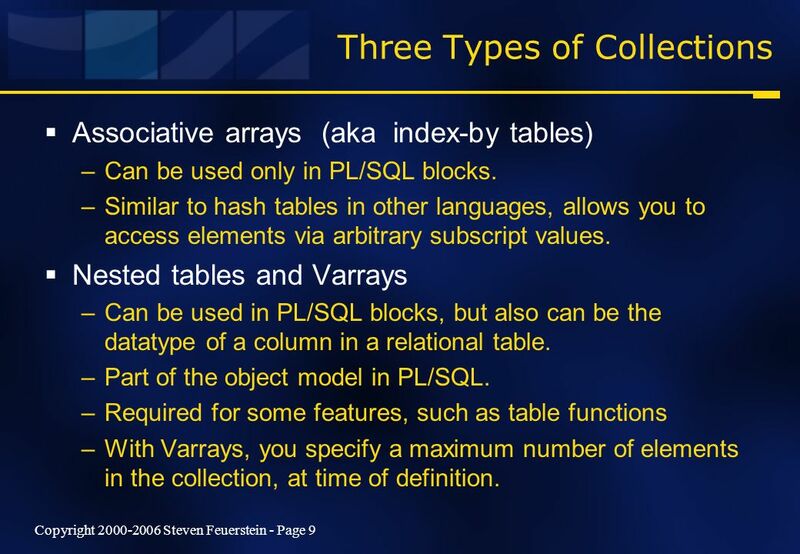 9 Copyright 2000-2006 Steven Feuerstein - Page 9 Three Types of Collections Associative arrays (aka index-by tables) –Can be used only in PL/SQL blocks. 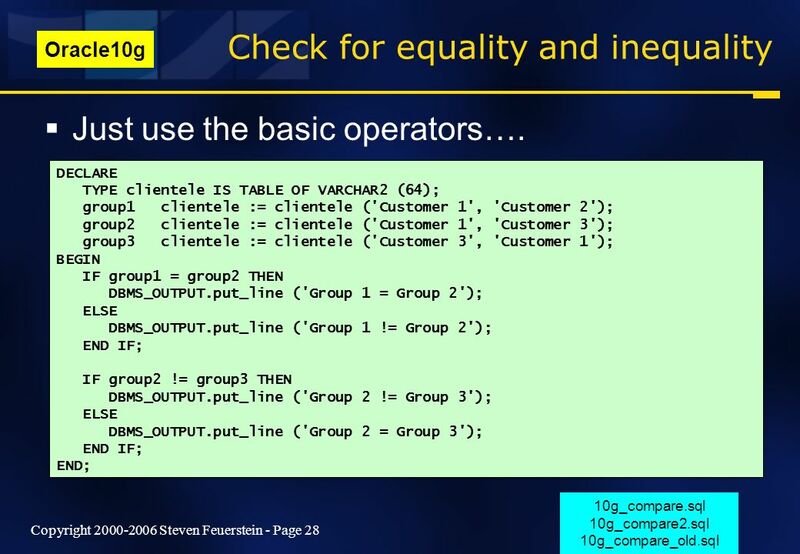 –Similar to hash tables in other languages, allows you to access elements via arbitrary subscript values. 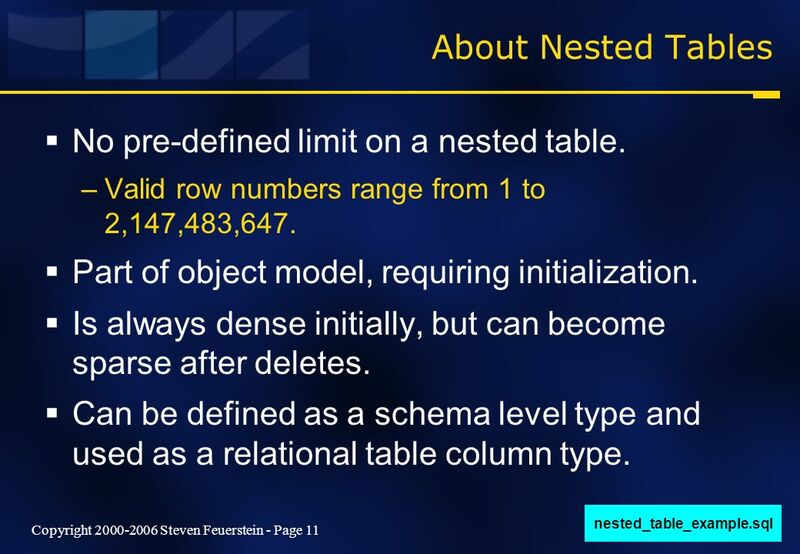 Nested tables and Varrays –Can be used in PL/SQL blocks, but also can be the datatype of a column in a relational table. 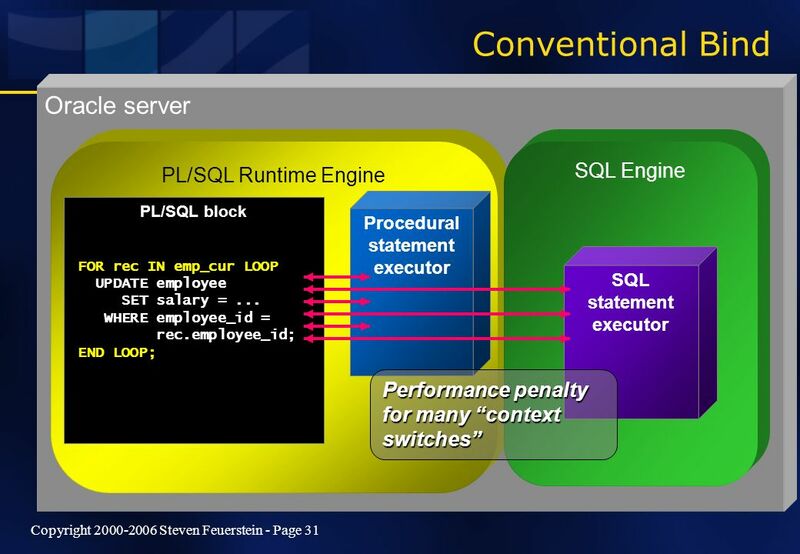 –Part of the object model in PL/SQL. 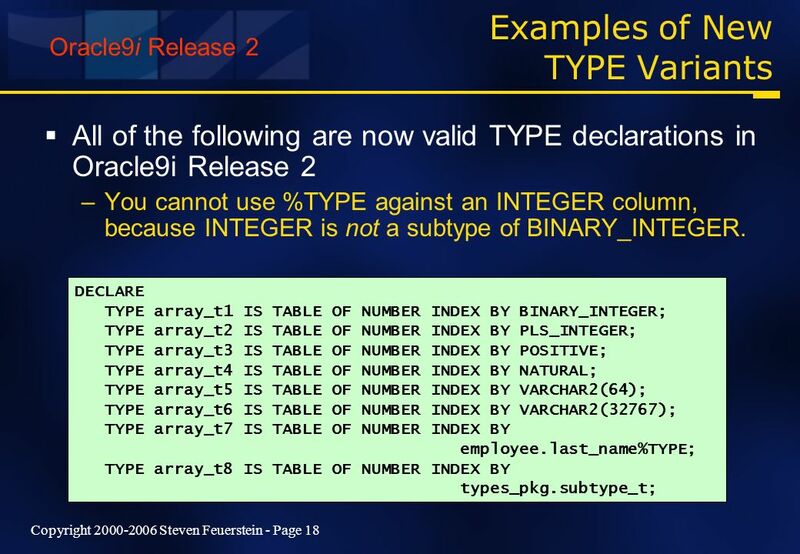 –Required for some features, such as table functions –With Varrays, you specify a maximum number of elements in the collection, at time of definition. 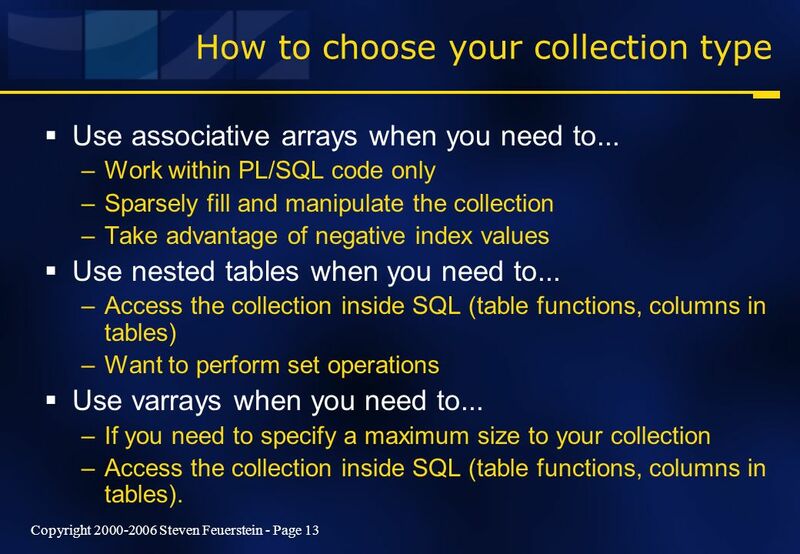 13 Copyright 2000-2006 Steven Feuerstein - Page 13 How to choose your collection type Use associative arrays when you need to... –Work within PL/SQL code only –Sparsely fill and manipulate the collection –Take advantage of negative index values Use nested tables when you need to... –Access the collection inside SQL (table functions, columns in tables) –Want to perform set operations Use varrays when you need to... –If you need to specify a maximum size to your collection –Access the collection inside SQL (table functions, columns in tables). 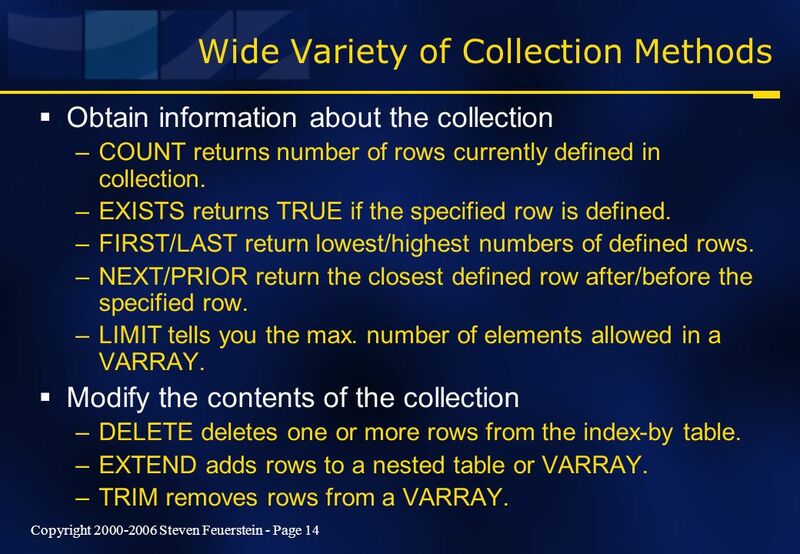 14 Copyright 2000-2006 Steven Feuerstein - Page 14 Wide Variety of Collection Methods Obtain information about the collection –COUNT returns number of rows currently defined in collection. 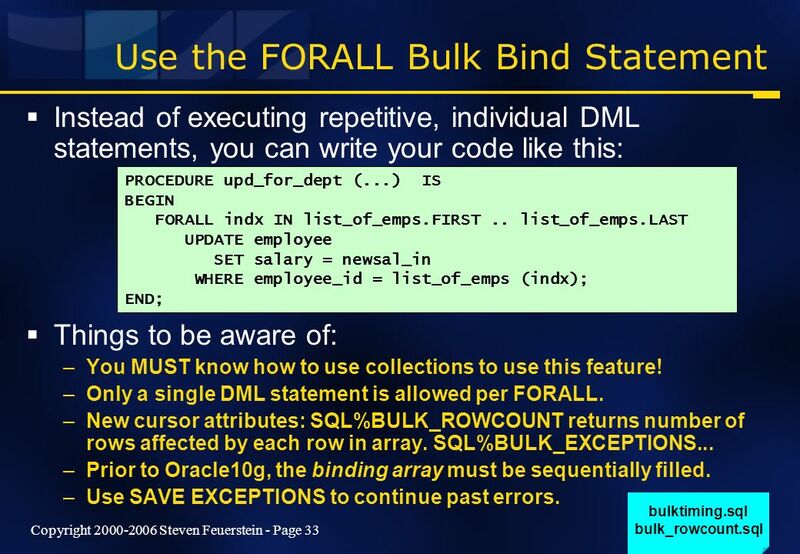 –EXISTS returns TRUE if the specified row is defined. 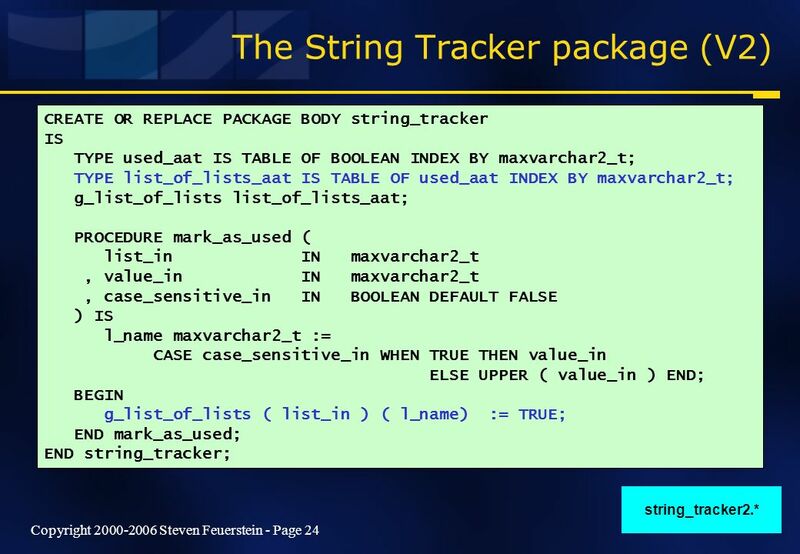 –FIRST/LAST return lowest/highest numbers of defined rows. 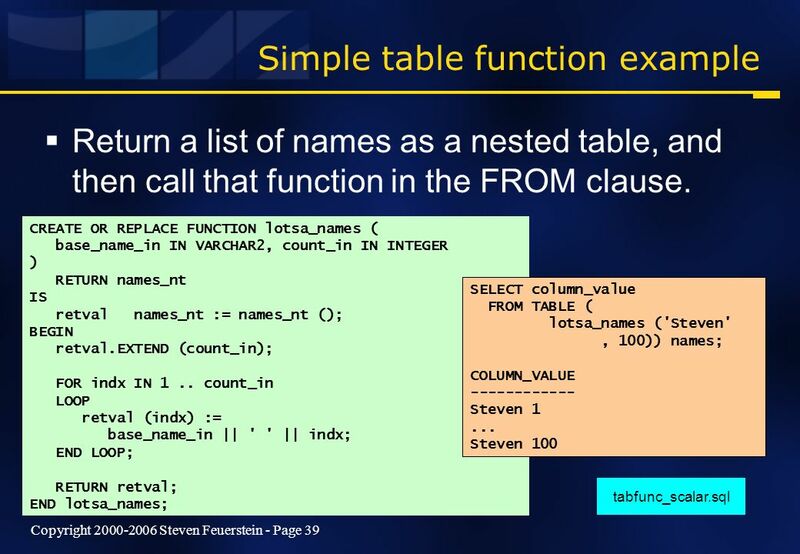 –NEXT/PRIOR return the closest defined row after/before the specified row. –LIMIT tells you the max. number of elements allowed in a VARRAY. 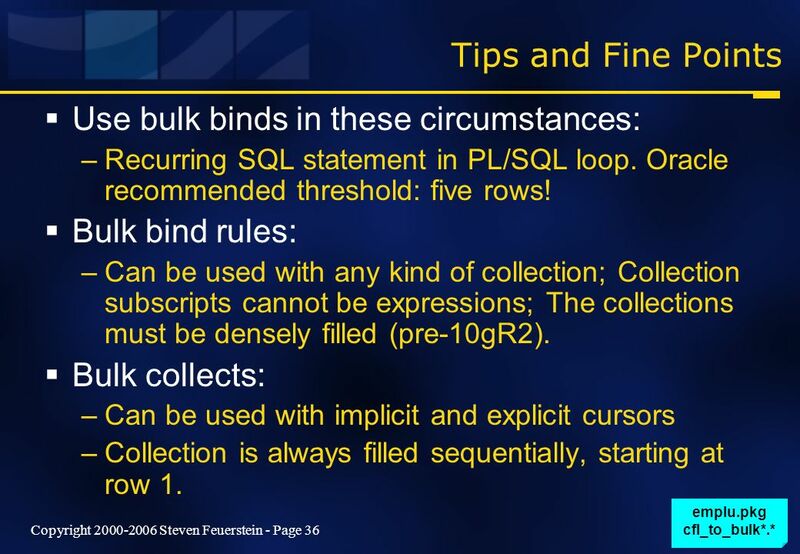 Modify the contents of the collection –DELETE deletes one or more rows from the index-by table. –EXTEND adds rows to a nested table or VARRAY. 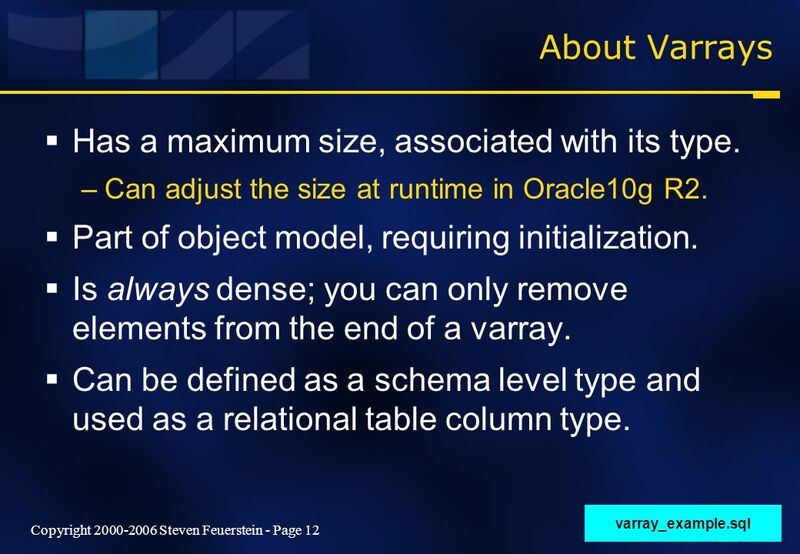 –TRIM removes rows from a VARRAY. 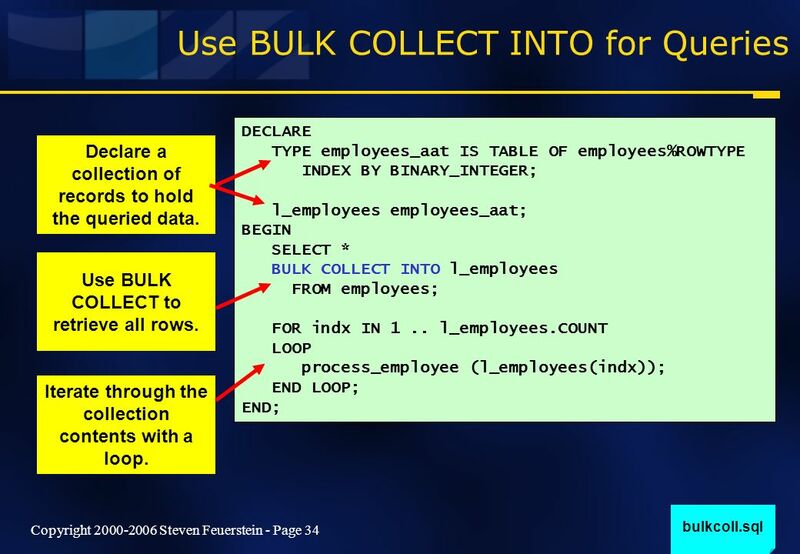 34 Copyright 2000-2006 Steven Feuerstein - Page 34 Use BULK COLLECT INTO for Queries DECLARE TYPE employees_aat IS TABLE OF employees%ROWTYPE INDEX BY BINARY_INTEGER; l_employees employees_aat; BEGIN SELECT * BULK COLLECT INTO l_employees FROM employees; FOR indx IN 1.. l_employees.COUNT LOOP process_employee (l_employees(indx)); END LOOP; END; bulkcoll.sql Declare a collection of records to hold the queried data. 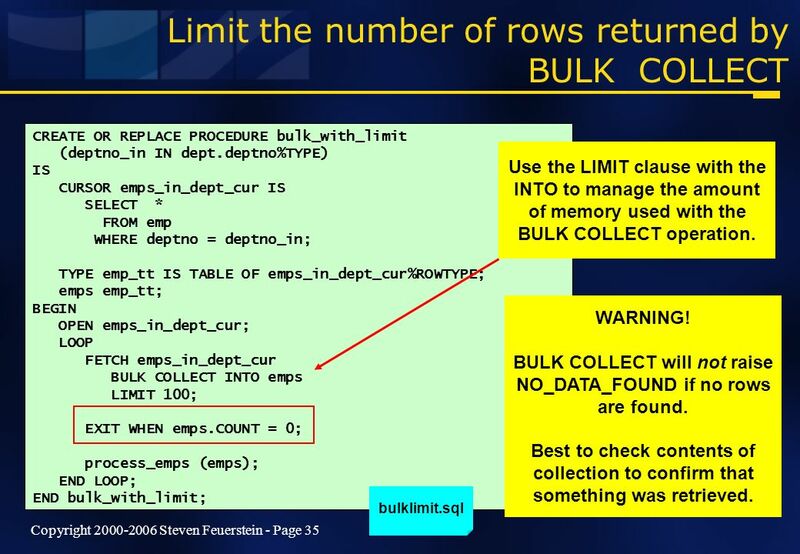 Use BULK COLLECT to retrieve all rows. 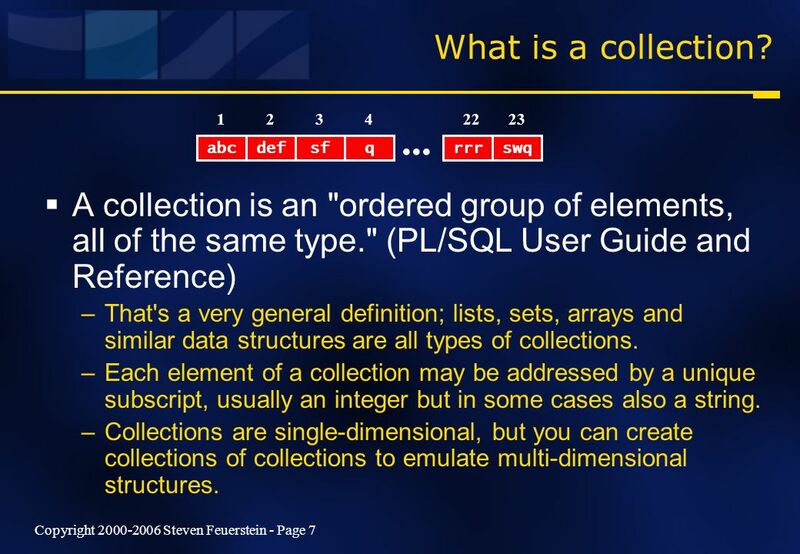 Iterate through the collection contents with a loop. 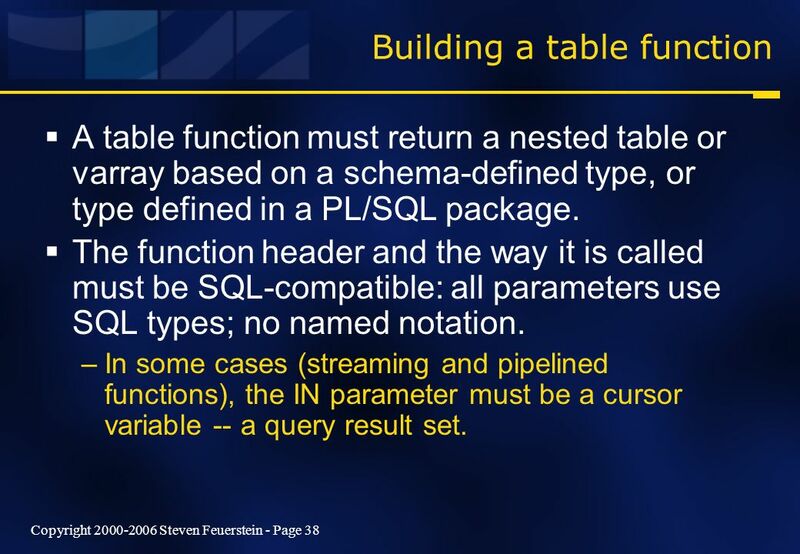 38 Copyright 2000-2006 Steven Feuerstein - Page 38 Building a table function A table function must return a nested table or varray based on a schema-defined type, or type defined in a PL/SQL package. 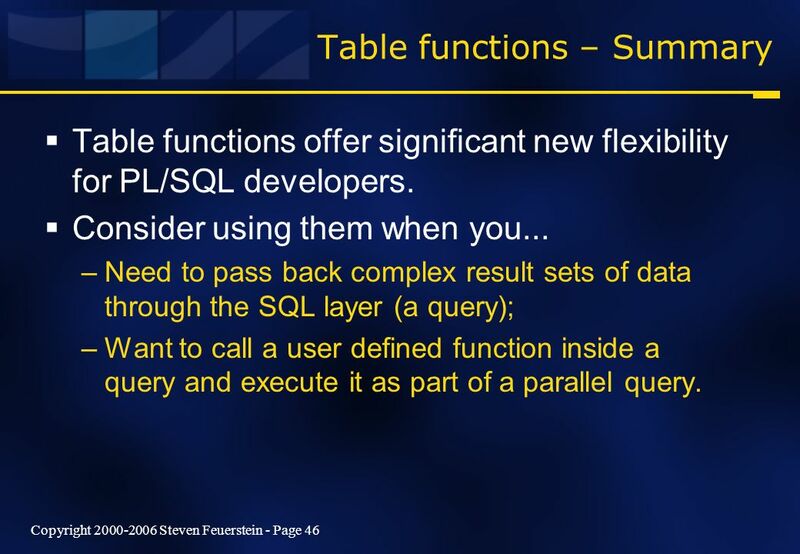 The function header and the way it is called must be SQL-compatible: all parameters use SQL types; no named notation. 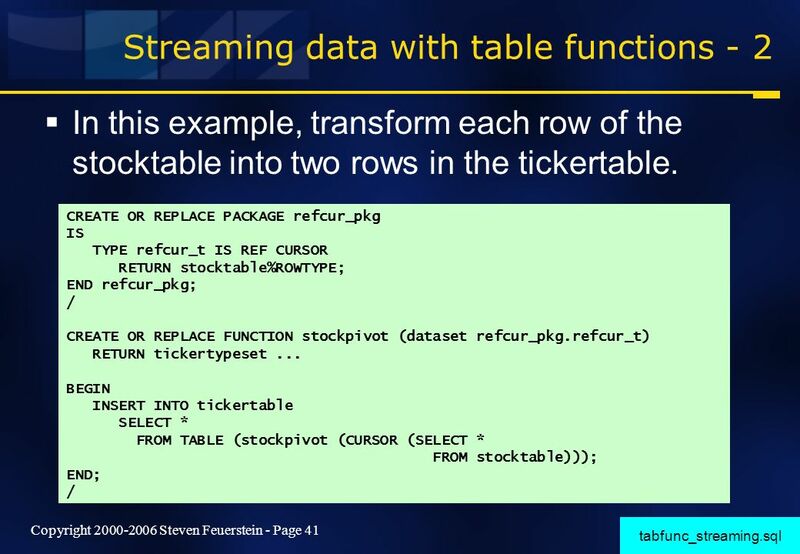 –In some cases (streaming and pipelined functions), the IN parameter must be a cursor variable -- a query result set. 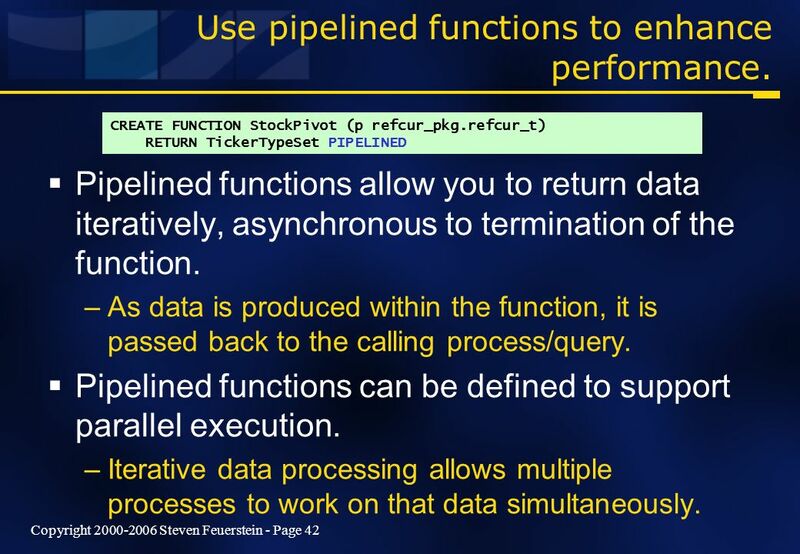 43 Copyright 2000-2006 Steven Feuerstein - Page 43 Applications for pipelined functions Execution functions in parallel. 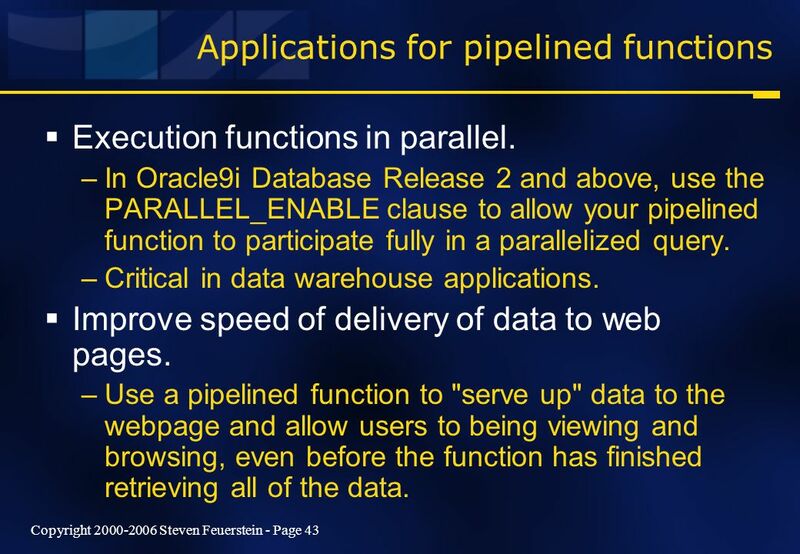 –In Oracle9i Database Release 2 and above, use the PARALLEL_ENABLE clause to allow your pipelined function to participate fully in a parallelized query. 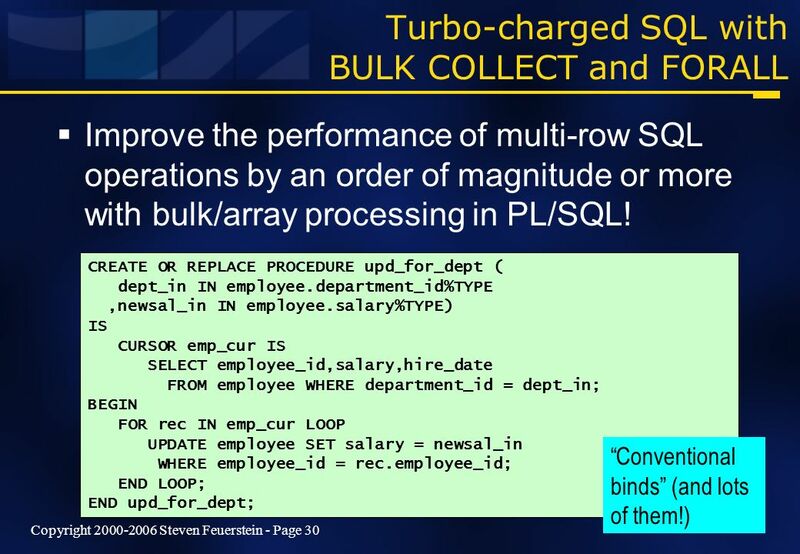 –Critical in data warehouse applications. 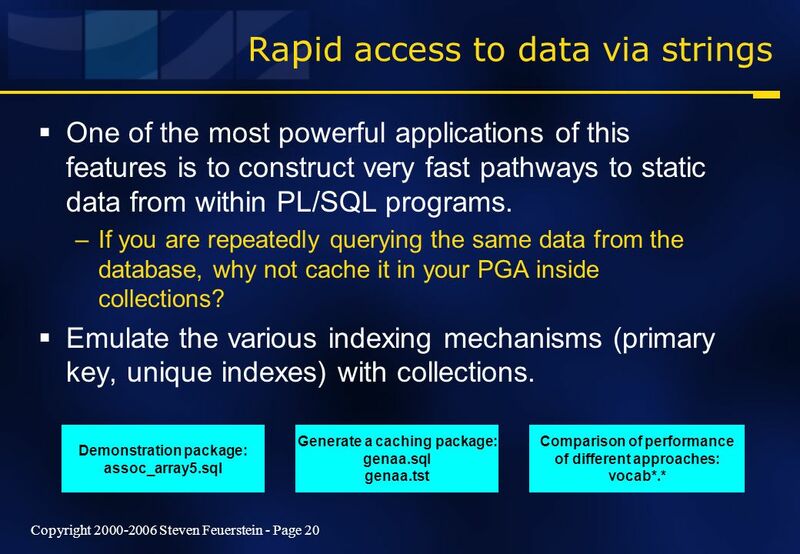 Improve speed of delivery of data to web pages. 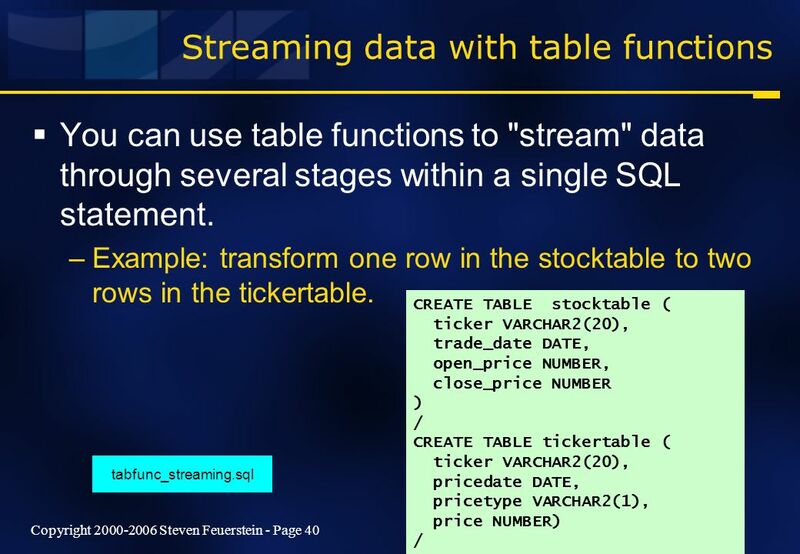 –Use a pipelined function to "serve up" data to the webpage and allow users to being viewing and browsing, even before the function has finished retrieving all of the data. 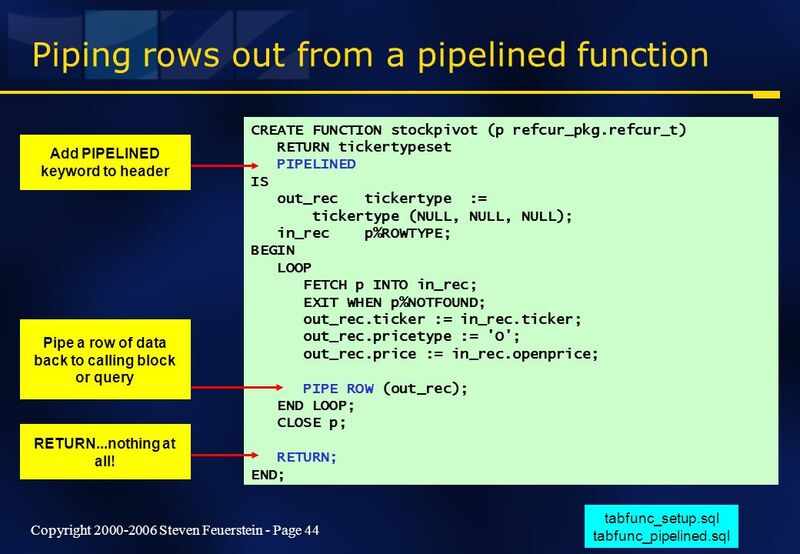 44 Copyright 2000-2006 Steven Feuerstein - Page 44 Piping rows out from a pipelined function CREATE FUNCTION stockpivot (p refcur_pkg.refcur_t) RETURN tickertypeset PIPELINED IS out_rec tickertype := tickertype (NULL, NULL, NULL); in_rec p%ROWTYPE; BEGIN LOOP FETCH p INTO in_rec; EXIT WHEN p%NOTFOUND; out_rec.ticker := in_rec.ticker; out_rec.pricetype := 'O'; out_rec.price := in_rec.openprice; PIPE ROW (out_rec); END LOOP; CLOSE p; RETURN; END; tabfunc_setup.sql tabfunc_pipelined.sql Add PIPELINED keyword to header Pipe a row of data back to calling block or query RETURN...nothing at all! 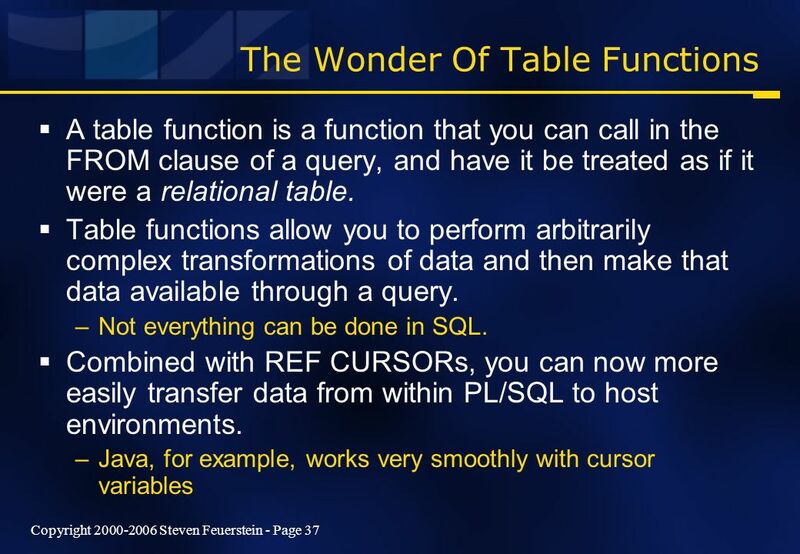 46 Copyright 2000-2006 Steven Feuerstein - Page 46 Table functions – Summary Table functions offer significant new flexibility for PL/SQL developers. 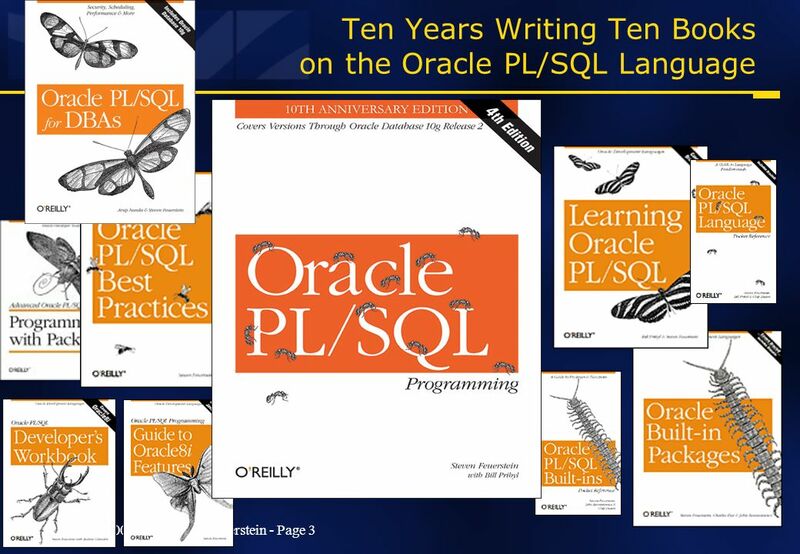 Consider using them when you... –Need to pass back complex result sets of data through the SQL layer (a query); –Want to call a user defined function inside a query and execute it as part of a parallel query. 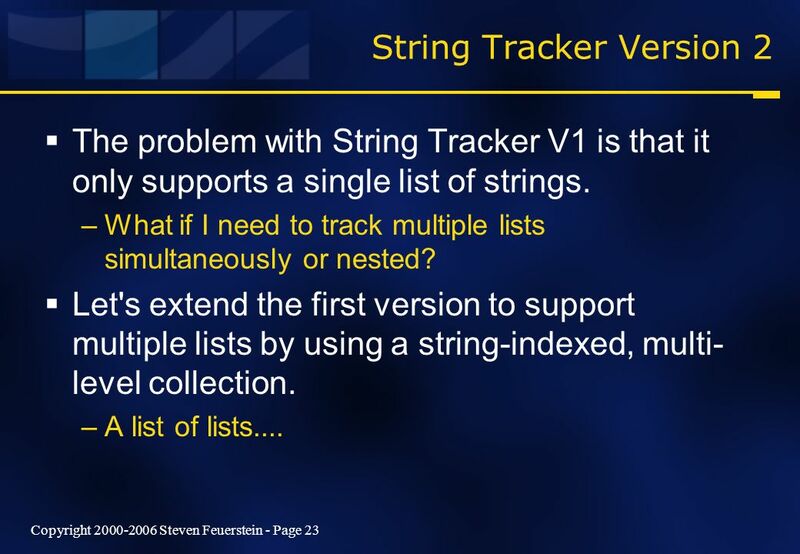 47 Copyright 2000-2006 Steven Feuerstein - Page 47 Collections – don't start coding without them. 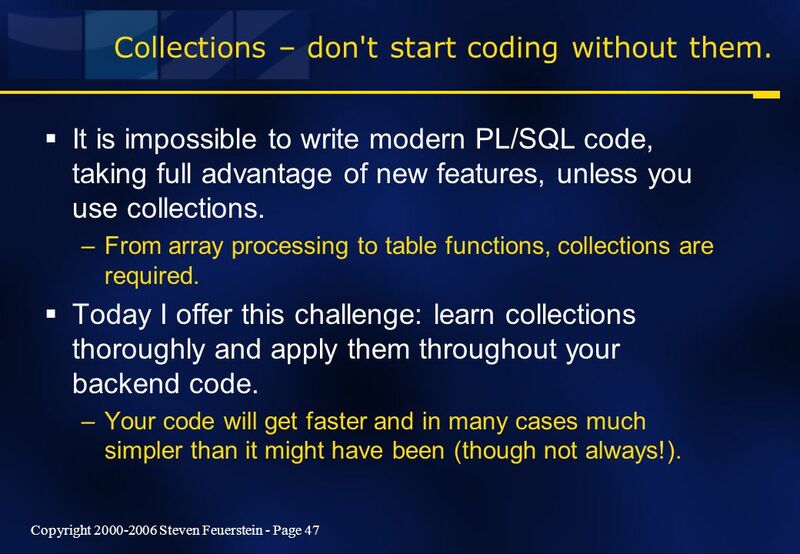 It is impossible to write modern PL/SQL code, taking full advantage of new features, unless you use collections. 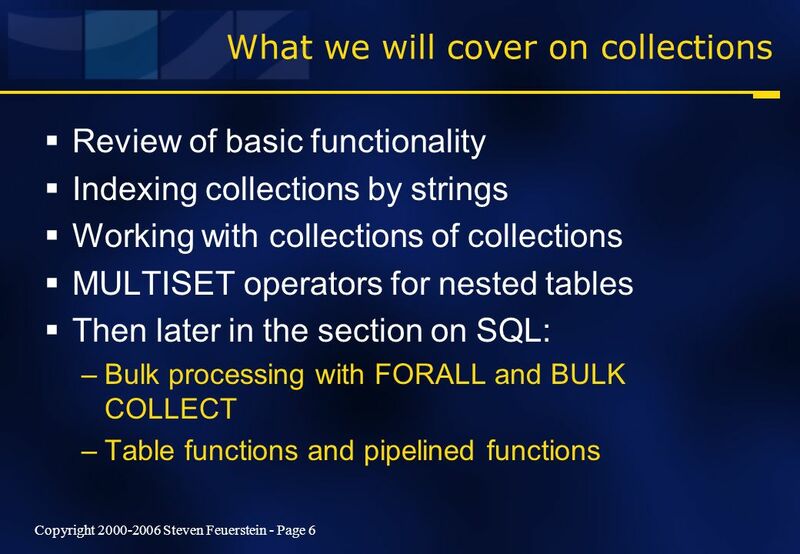 –From array processing to table functions, collections are required. 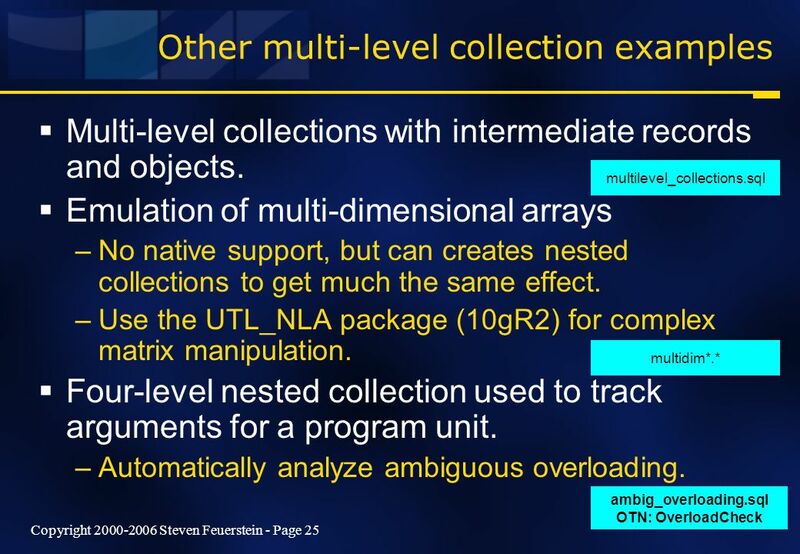 Today I offer this challenge: learn collections thoroughly and apply them throughout your backend code. 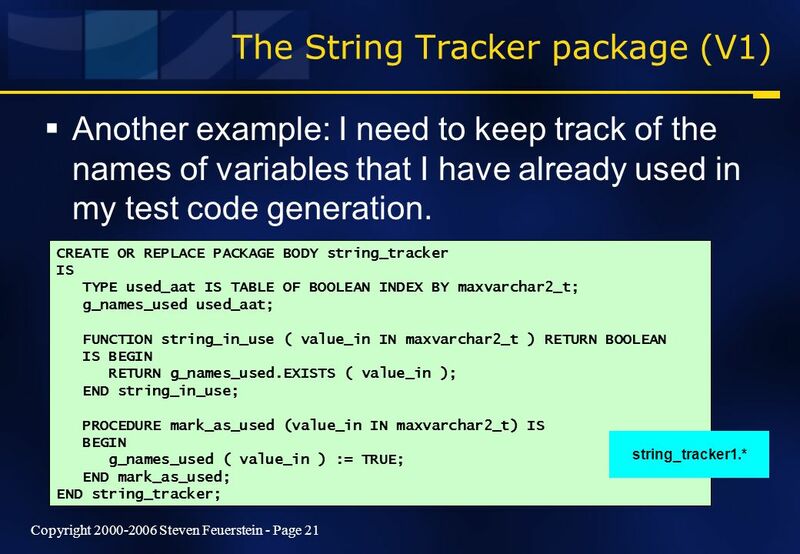 –Your code will get faster and in many cases much simpler than it might have been (though not always!). 48 Copyright 2000-2006 Steven Feuerstein - Page 48 OPP 2007 February 28 – March 1, 2007 San Mateo Marriott San Mateo, California An ODTUG SP* Oracle PL/SQL Programming Conference * SP – Seriously Practical Conference For more information visit www.odtug.com or call 910-452-7444 ODTUG Kaleidoscope June 18 – 21, 2007 Pre-conference Hands-on Training - June 16 – 17 Hilton Daytona Beach Oceanfront Resort Daytona, Florida WOW-Wide Open World, Wide Open Web! 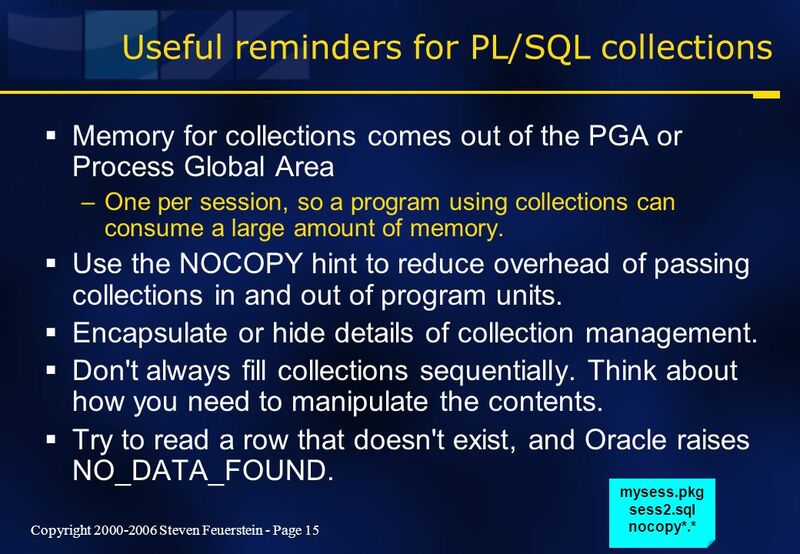 Download ppt "Copyright 2000-2006 Steven Feuerstein - Page 1 OPP 2007 February 28 – March 1, 2007 San Mateo Marriott San Mateo, California An ODTUG SP* Oracle PL/SQL." 4 Control Statements: Part 1.